Small Jobs, Large Jobs we do them all! Dave & Shirley Dierolf started the business out of their house in La Mesa, California. Their daughter and son-in-law took over the business in 1990 and with the great reputation behind them, were able to build the business from 9 employees to over 50. We are now located in Spring Valley, California and able to service all of San Diego County. 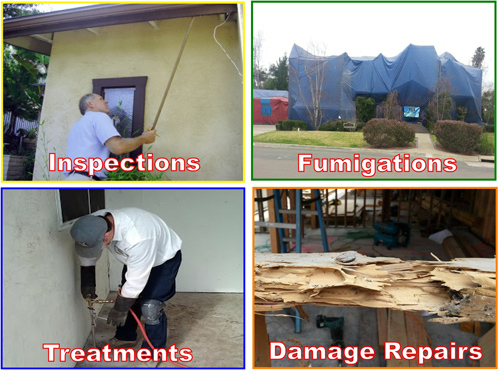 D&S is proud to be your full-service termite and pest control provider. Whether it's termites, ants, bed bugs or rodents, D&S has the right treatment plan for you. We believe that one satisfied customer leads to ten more, and we do everything possible to ensure that you recommend us to friends and family. We take pride in everything we do. Small jobs, large jobs, we do them all. it's D&S for all your pests! Effective April 22, 2010 contractors who conduct Home improvement activities in housing built prior to 1978 and child occupied facilities Must be certified in accordance with the new EPA Renovation, Repair, and Painting (RPP) rule. It's important that property owners, real estate agents, general contractors, plumbers, painters, carpenters, electricians, remodelers, handy-men and all others who work in home repair or maintenance be aware of the rules and the requirements for compliance. Failure to do so can result in a fine of $37,500 per day, per violation! For more information go to: www.epa.gov/lead/ . NO subcontractor is ever involved! Ensuring top quality service and workmanship.